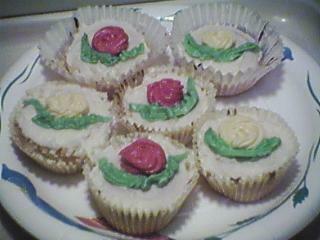 Here it is spread on cupcakes and then colored and piped for designs! Beat butter until fluffy. Add 2 cups of the powdered sugar, beat, and then add 1/4 cup milk and the vanilla. Gradually add the remaining sugar, stirring. Add more milk until it is the consistency you desire. This is the straight recipe; it dries white and tastes vanilla. With the following variations, you can change the icing's flavor and color; using many different types for, say, Dutch Holiday Cookies, is ideal. For peanut butter icing: Substitute peanut butter for the butter. For mint icing: Add 1/4 teaspoon of mint extract with the milk. For orange icing: Use orange juice instead of milk. For chocolate icing: Use only 4 cups of sugar and then 1/4 cup of cocoa powder, added in with the first two cups of sugar. If you have any other type of icing in mind and can find an extract for it, simply try lessening the amount of vanilla in the recipe (1 1/2 teaspoons) to only 1 teaspoon and adding a half teaspoon of your intended flavoring, or if it is a weaker one, a whole teaspoon against a half teaspoon of vanilla. Adding milk in with any fruit juice-flavored icing is probably a bad idea; use water for additional moistening in these cases.